Haskell has written a wonderfully styled and incredibly detailed account of a year in the life of on very small circular patch of old-growth forest land in Tennessee. He calls this little space a mandala because of the balance and intricacies, but I think it also creates a kind of religious feeling – a sense of awe. The author is a practiced observer of nature, but imo, it’s really the nice example of literary non-fiction which sets this book apart. The style and extensive use of metaphors elevate it way above text-book ecology. 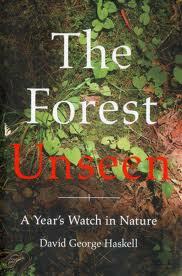 The main question is “Can the whole forest be seen through a small contemplative window of leaves, rocks, and water?” and Haskell makes his point. I kind of wish there had been photos but that might have missed the point of using your imagination to get there. Plenty of photos on the web. The structure is like that of a diary (or field notes) with an entry every few days or weeks except that Haskell digresses quite a lot but mostly keeps it quite interesting. This is not my usual fare and I wasn’t totally enamored but I can see where a nature buff might be blown away.